Rotisserie chicken is so good and it is fairly easy to make. 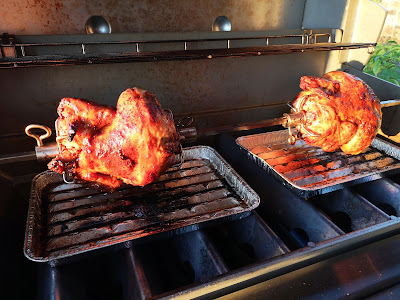 You do need a Rotisserie on your BBQ. If you plan to purchase a rotisserie, buy a good one. It pays in the long run. I have a video on my YouTube Channel that shows this in detail. Clean and wash the chickens and remove any inners. Quarter the apples and lemons and try to stuff the chickens full with 1 apple and 1 lemon in each chicken. Tie the chicken so the wings and the legs will not come loose. Rub the chicken with my #1 meat rub. Then insert the rotisserie forks and shaft. Cook the chickens for about 1 hour. Check with a meat thermometer after one hour. Inside temperature should be over 72°C or 160°F. For the dark meat go a bit higher. Let the chicken rest under some foil for about 10 minutes before cutting.